George was born 11 May 1888 (birth certificate number 1888/4851) in Aratapu in the northern Kaipara region. We have a record in 1907 in the City and area directories, of a Abraham living in Aoroa (he would have been 19 years old) – just south of Dargaville, on the banks of the Northern Wairoa River, and he is listed as a Carpenter. Family rumour has it that he went to Australia with Wirth’s Brothers Circus who did do a tour of New Zealand in 1910-1911 (there were previous tours also) and it does tie up with the last official records we have for George. We do not have any further record of George at this present time. 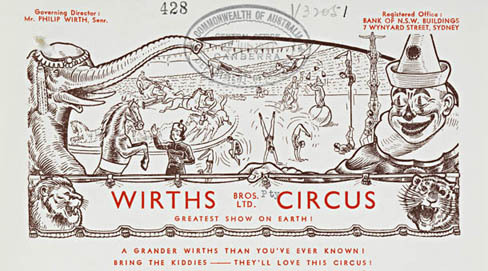 Wirth’s Brothers Circus – New Zealand tour 1910-1911 Official programme – 31st year of organisation. Acts included: Miss May Martin (trapeze), Harry and Edith Frantz (barrel jumping), Monsieur Marco (animal trainer), Stella Martin (dancer on horseback), Mr John Welby Cooke (jockey), Christie Brothers (parody jockey act), Captain Burrows (elephants), The Tossing Testros (jugglers), Marizles Wirth and Edith Cooke (double ménage act), “La Sport” by Miss Millie Dagmar (dog trainer), C Cooke (clown), Mr Philip Wirth (performing horses), Lentons (comic hat manipulators), Raymond the Great (escape artist).